Outside of class I spent most of my time in the theater or music hall. It goes much further back than college though – as a boy I sang in a children’s choir and later took up the saxophone. A love of music was a big part of my childhood, and it hasn’t gone away. When it came time to choose a course of study I decided that the life of a musician wasn’t for me, and followed what I was best at academically: math and science. And while I enjoyed engineering, I realized relatively early on that I didn’t really want to be a structural engineer. I also took many architecture classes and studios and loved those experiences. Acoustics became this beautiful marriage between my interest in design, my aptitude for engineering, and my love of music. I stumbled upon this field in college and I consider myself incredibly fortunate – I love what I do. My earliest and strongest influence within the acoustics field is Carl Rosenberg. I took a class with Carl while an undergraduate at Princeton, in the architecture school. I so loved the class that I took him to lunch and asked him if he could give me a job. He did, and Acentech has been my professional home ever since. And Carl has been a personal and professional mentor ever since, too. There are other influences as well of course – my time away from Acentech earning a Masters in acoustics was mostly influenced by my advisor, Paul Calamia, where I focused particularly on computer modeling and simulation – a fascination that also continues; I’m proud to say that Acentech is at the forefront of the industry when it comes to the use of acoustics modeling and simulation in design practice. Another major influence was Chris Jaffe, a world renowned acoustician with a career in acoustics at the firm he founded. When he retired from that firm he decided he wasn’t finished with acoustics just yet. 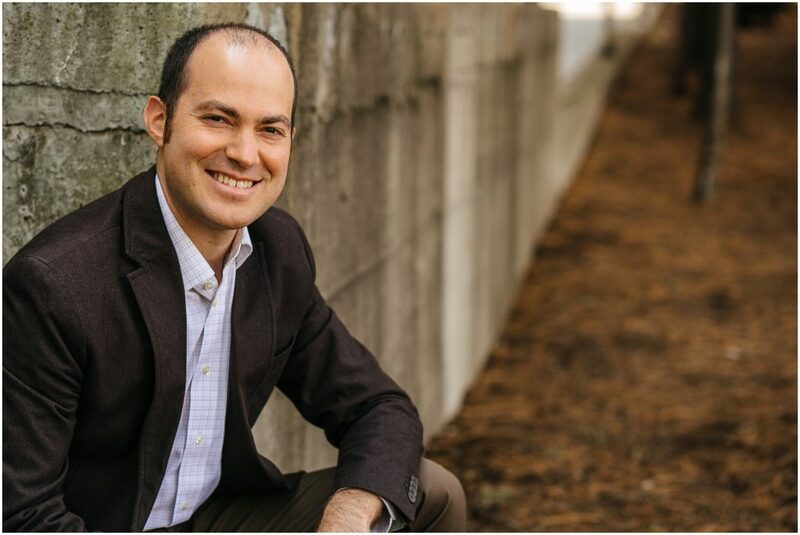 He joined Acentech, helped us launch our performing arts studio – Studio A – and helped shape my thinking and that of my colleagues particularly as it relates to the acoustical design of performing arts venues. Chris remained a part of the Acentech family for several years, up to his death in 2013. In my time at Acentech I have been involved in some capacity with well over 2,000 projects, large and small, and just about every one of them has been a learning experience. It’s a constant evolution – a bit like learning to dance. When you learn to dance, you might start with some basic steps. But the more you learn, the more you realize how many variations there are – different styles of dance, different nuances or steps or flourishes that you can contribute. As acoustics consultants, Acentech is a bit like the partner in the dance most of the time. We take our lead from the architect, and it is incumbent upon us to make recommendations that are essential to the design and the success of the project and yet also complement the architectural vision for the projects we help to design. In performing arts projects we will sometimes take the lead for a time, but even then it’s a partnership. The longer I am here, the more that I have come to learn how best to dance with different partners, achieving excellence in what we do in a way that not only results in a great product but also jives well with our partners’ moves. Honesty. Often designing is only part of our role; a big part of our role is also to inform, so that owners and architects and building users can make smart and well-informed decisions about their spaces. We owe it to them and to ourselves to ensure that our guidance is based on real and accurate information, undergirded by our depth of experience and rigorous analysis. Clarity. Our best work is of little value unless we can convey our priorities – their relevance, importance, constructability, integration and coordination, etc. – in a clear and straightforward manner, understandable not just by people “interested in sound” but also by our design partners, the building owners, etc. Creativity. It is rare that an acoustical challenge only has one possible solution. Challenges are opportunities for design creativity. We need to respond to the constraints of a project – be they budgetary, spatial, aesthetic, or otherwise – in a nimble fashion that address challenges effectively but also within the project’s larger context. Practicality. Our recommendations must be buildable. Forward-thinking. A focus on the practical and realistic does not mean that we cannot “push the envelope.” In fact, every project is a learning opportunity and also an opportunity for innovation – big and small – that collectively keep Acentech at the forefront of the industry. I have a few roles – head cheerleader, mentor, emcee, QC. But my primary focus is on my colleagues and their relationships with our clients. It is my responsibility to see to it that our project work is well distributed – that the right team is paired up with the right projects. That means that we have the best and most qualified and experienced consultants on every job, that the project work is interesting and also challenges the consultants that do the work, that the work is fairly and appropriately distributed among the staff, and that our clients are well served by our team. Our clients have unique approaches to design, and without ducking the question I think it is fair to say that one thing that makes Acentech somewhat unique is our ability to work successfully and collaboratively across a huge range of styles and approaches. The work that we did with Foster & Partners – and their local partner, CBT – on the Museum of Fine Arts in Boston perhaps makes this point. 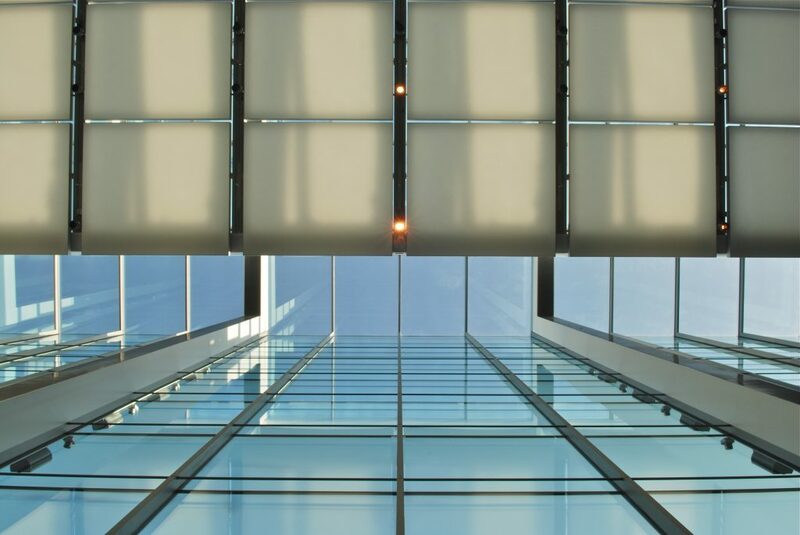 A huge glass-enclosed atrium of stone and steel can be a cacophonous disaster if left untreated. Instead, the MFA enjoys a remarkably functional and flexible space that is comfortable to be in – whether for dining (there is a restaurant that operates in the middle of the courtyard), partying (the museum uses the space for a wide variety of functions), or simply strolling through enjoying the artwork. The room still reads as a glass-enclosed courtyard of stone and steel – but we worked closely with Foster & Partners to incorporate a range of sound-absorbing materials that fit the vernacular of the room. Some of those materials serve other functions as well – such as the stretched microperforated membranes at the roof, which reduces solar heat gain in the room. That space was a collaborative effort, to be sure. And it didn’t just happen around a drafting table either – computer modeling and simulation were a critical part of the design process. Acentech often employs acoustics simulations for spaces that are beyond their traditional function of performing arts spaces. In the case of the MFA, the trustees of the museum as well as the design team sat in the driver’s seat and walked through an immersive, three-dimensional simulation of the room during the design process, comparing the sound of the space under various design schemes. 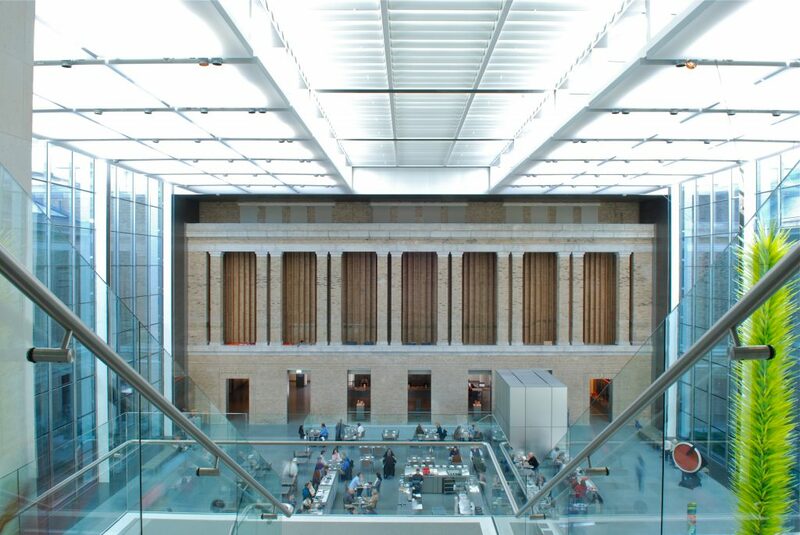 That iterative experience – we created over dozen acoustical simulations of that room – ultimately led to the acoustical design that museum patrons enjoy today. 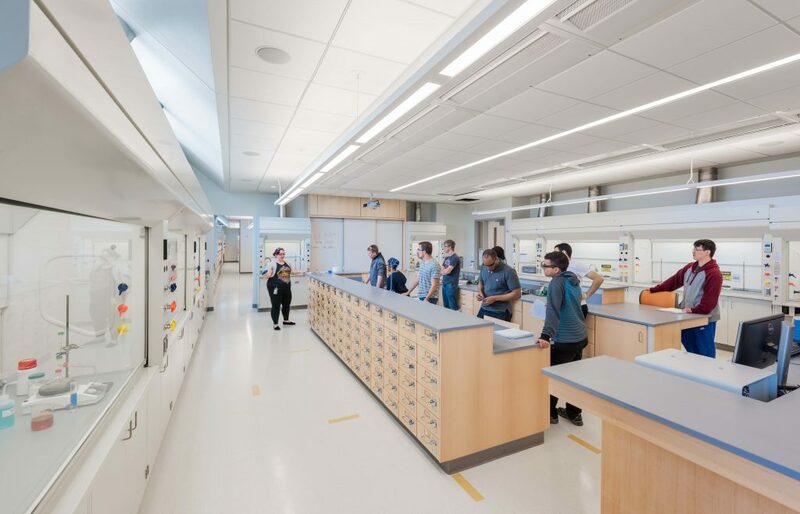 That deeply collaborative approach is on display in other buildings too – like the recently completed University Hall building at UMass Boston. The building combines the chemistry department, the visual arts department, music, theater, and dance all under one roof – and that roof happens to be directly under the flight path to Logan Airport. In the recital hall, we incorporated a range of variable treatments in the room so that the music department can alter the room to suit their needs – from jazz to sacred choral music to classical recitals. The design of those elements was the result of our discussions with the music department about their wide ranging needs and our collaborations with the architect (Wilson Architects of Boston) and the project’s theater consultant (Theatre Projects Consultants of Norwalk, CT). And the design of the glazing – yes, there is a huge window in a recital hall in the flightpath of a major international airport – resulted from measurements we made on site of aircraft noise, rigorous analysis of window sound transmission properties, and careful coordination of the window design in the architectural context with the design team. The result is a double curtainwall system – an outer curtainwall that follows the contour of the building’s exterior and an inner curtainwall that forms a part of the musician’s platform enclosure – that are separated by an airspace that varies in depth from 5 to 8 feet. And these are just a few details in an extraordinarily multidisciplinary building that could only have been realized with client engagement and close collaboration among the design team. The process starts with engagement with our team and our collective client – to be sure we understand the needs and goals of the project. We must be “client first.” Once design begins, we use a fairly wide range of tools – sophisticated measurement tools for assessing existing or environmental conditions, BIM software, acoustics modeling software for room acoustics design and sound system design, finite element modeling for complex structural dynamics analysis, signal processing and data analysis using Matlab routines as well as computer programs that we have written in-house, acoustical simulations programmed in Max MSP, and good old spreadsheet calculations. 3D modeling certainly plays a critical role – whether its laying out a sound system in coordination with the rest of the design team, or developing an immersive, three-dimensional sound simulation – we couldn’t do what we do without thinking three dimensionally. In acoustics particular the state of the art has evolved by leaps and bounds in the last decade, and that evolution continues apace with the advent of readily available VR platforms, increasing computer horsepower, improved understanding of the perceptual impact of three-dimensional acoustical signals, and other advances. Commercially available design software sometimes struggles to keep up, but that’s okay – it makes it a fun time to be part of a firm at the cutting edge of using these tools to benefit design. When we started bringing simulations into regular use in our practice, it was a game changer – it utterly changed the dynamic of how we could interact with clients, colleagues, and collaborators in developing designs. There remains a perception though that such simulation is out of reach for “simple” or “every day” project work. Either that simulation is too expensive or too cumbersome or insufficiently nimble. 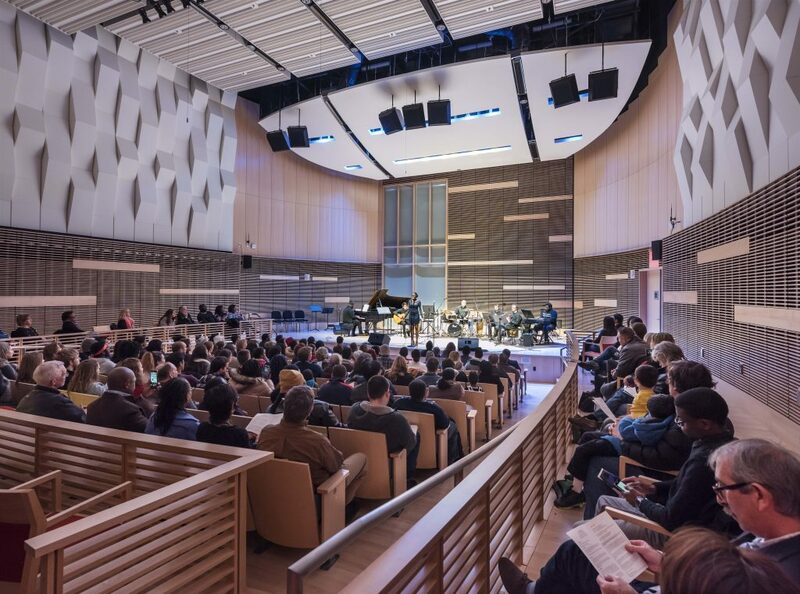 But that is changing – and the broader design community would do well to harness the power of these tools not just for “fancy concert halls” but for any circumstance where sound matters. Which brings me to my second point: sound matters. Almost always. It matters in a museum, it matters in a library, it matters in a dorm building, it matters in a research center and in the office and in a hospital and in a pharmaceutical lab. The future of work – whether collaborative and open or focused and “deep work” – depends on an understanding of acoustical design in the office. The future of learning depends on an understanding of acoustics and technology in (and outside) the classroom. The future of healthcare depends in part on knowing that you can’t recuperate well or quickly if you’re constantly awoken by the buzzes and beeps that permeate our hospitals. Sound really matters, and the design community needs to know it. I expect that the pace of design will continue to hasten. I expect that simulation, visualization, and VR will increasingly play a role in conveying design ideas to clients and among design partners. And yet lots of fundamentals will remain unchanged: great buildings require thought, engagement, true collaboration, and excellent design. We will remain “envelope pushers” – we’ve long been innovators, whether in acoustical simulation, remote monitoring of sound and vibration, sound masking, or other realms of acoustical design – and we will thrive on the continued evolution of these and other design tools in the years ahead. Listen more. Talk less. We’re in an industry where listening is central – we need to listen to rooms incredibly critically and understand the implications of what we hear. We need to listen to architects and engineers and understand their priorities and objectives and constraints. We need to listen to clients and building users about their real and important aural experience. When you’re talking, you might be teaching but you’re not learning. And the younger version of me (and the current version of me!) could do well to listen more and learn from the process.